Note: Before worrying about strengthening your bar, make sure you can do bars correctly and easily. For that, our "Bar Chord Mastery" course is highly recommended (there's nothing like it!). Even long time players often suffer from an undeveloped, or improperly developed bar. 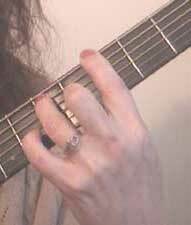 Not having a strong bar, one that does not tie up the other fingers, which limits their mobility, limits all of your playing. Special exercises must be practiced over an extended period of time and practiced correctly, or you will cause big problems. Keep a space between the fingers at all times. Do NOT let 2 or any other finger lean on or toward the bar. Release and rest frequently, and whenever you feel excess fatigue. Pain is bad, do not hurt yourself! Build it everyday, for a few minutes that's all. Do this up and down the neck. 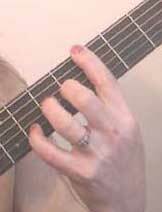 Start at 5th fret, or where comfortable. Principled Players, use the Basic Practice Approach. 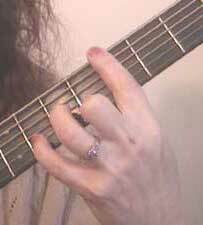 One last tip (about your fingertip) - it is a help to release pressure from the fingertip part of the bar when you are playing the upper strings. It greatly aids endurance. Re-apply pressure when you get back down there.